Anti-Termite Brikgrip® DPC 3-layer 250 micrometer is an SABS approved damp proof course that is utilised in preventing rising damp in walls, as well as efflorescence and flaking of the wall covering. The sheeting is tear and puncture resistant and contains a pesticide which makes it termite resistant, creating an essential barrier to protect your home from the outset. 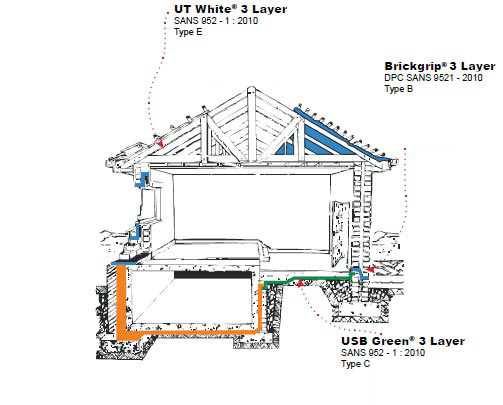 Anti-Termite GREEN USB 3-LAYER 250® sheeting is tear and puncture resistant to prevent rising damp through the floor slab, it is also termite resistant, creating an essential barrier to protect your home. 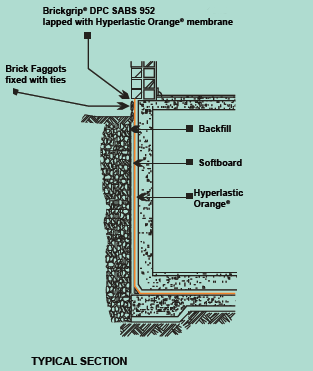 The waterproofing of a basement is dependent on the structural design. Gundle Tanking Membrane keeps your basement dry and keeps the damp from seeping into the walls when a portion of your house is underground or built against a hill, where you are most likely to have a high moisture content. Available are widths of 3m and 4m, in 30m lengths. One layer of 375μm HYPERLASTIC ORANGE® waterproof sheeting bearing SABS 952-1 2011 Type A. Joining: All joining shall be carried out strictly in accordance with the manufacturer’s instructions. It has a cross-linking effect between the different layers, which gives the sheeting added strength. This means that co-extruded sheeting of 170 or 180 microns in thickness is stronger than a mono-film of 250 microns in thickness. Each layer can have a different formulation. For instance, the top layer can be UV stabilised while the bottom layer can contain anti-oxidants to prevent breakdown caused by heat exposure. 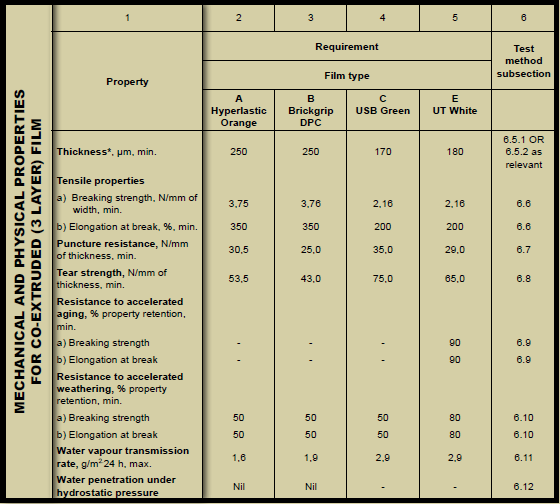 The following is an extract from the SABS 952 specification covering co-extruded films. USB GREEN 3 LAYER 170® is co-extruded, consisting of the following: Outer layer – Black low-density polyethylene containing carbon black, which is a natural ultra-violet inhibitor. Middle layer – Black low-density polyethylene. Outer layer – Green low-density polyethylene, which allows for easy identification on site and has enhanced puncture resistance. Note: Because of their high carbon content, USB Green 3 LAYER 170® can also be used where SABS black sheeting is specified, as it exceeds the minimum specification required for SABS black. 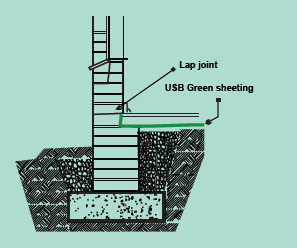 One layer of USB Green 3 LAYER 170® damp proof sheeting bearing SABS 952 – 1 : 2011 shall be laid in the widest practical widths to minimise joints and shall be turned up, dressed to load bearing walls, and lapped with Brickgrip SABS DPC. 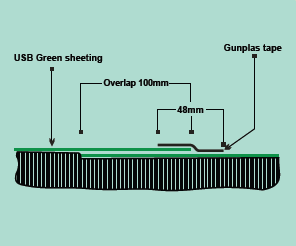 Gunplas USB Green 3 layer 170® may be lapped according to specifications.